I stood in the corner pretending to gaze out of the open window, my face turned away from the crowded room of people. People filled with hope. 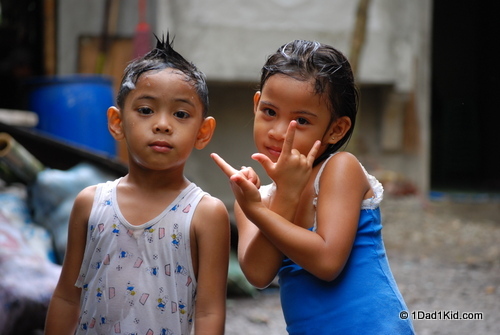 I clutched my camera against me as I willed the tears to go back up their ducts. I was desperate for a breeze, not just to relieve me from the sweltering heat of the conference room but to also evaporate the damning evidence from my face. I know the power of tears. And normally, I’d have no shame in shedding them. Even in front of others, including strangers. But I couldn’t this time. I didn’t want them to mistake my tears. I wasn’t crying about their situation, or the condition of the hundred or so children patiently waiting their turn to be examined, weighed, and prodded. No, I was crying because of my own condition. I felt like the saddest excuse for a human who walked that day. Its effects struck me solidly to my core, grabbed my deeply buried internal wounds, and ripped them open. I stood gazing at an invisible mirror laying bare my sad, wretched state. What had started all this? His nickname is Ian. He was 14 years old and one of the oldest patients we would have this mission. 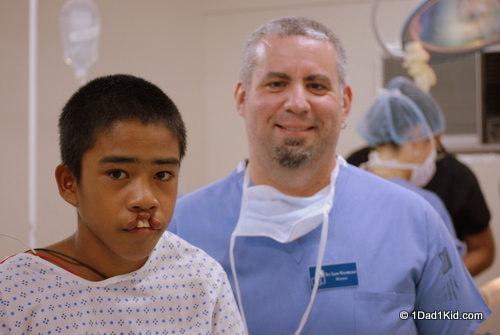 I was in Kalibo in the Philippines with Uplift Internationale taking part in a project to perform life-altering surgery on people to repair cleft lips and palates. 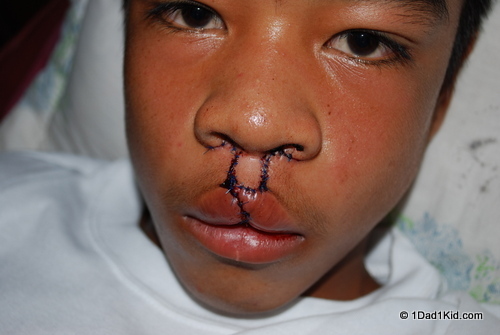 Children who have this congenital deformity, particularly if it’s a cleft lip, suffer fantastic humiliation. The local dialect even has a name for them which translates to cut lip. 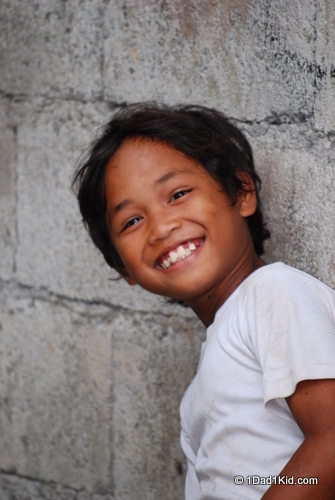 Children are mocked and scorned to the point where they cannot go to school. Or, like Khian, they avoid any reflective surface, shamed to see their visual deformation taunting them. So for all intents and purposes this surgery is truly life altering. 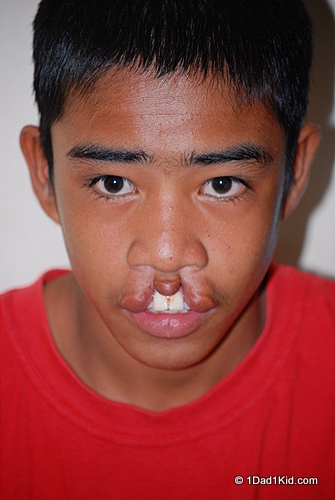 Ian had struggled with a pretty severe case of a cleft lip for his whole life. He was in this humid, hot room with his “auntie” who had heard Uplift was coming to do these surgeries for free. My job as part of outreach was to be the photographer and blogger for this particular mission. I was to visually document the project, and I walked around the room snapping photos of the children, their families, and our team in action. Then I came to Ian. He had the saddest eyes. 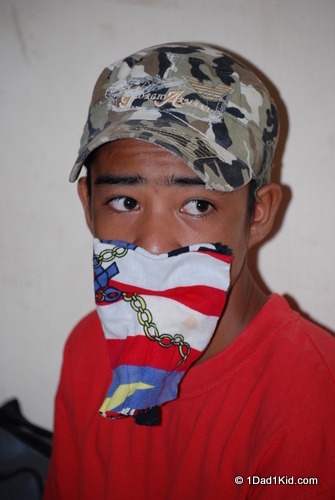 It was obvious he was here for surgical screening as he kept a handkerchief to his face the whole time. I wanted to photograph him like I had the others. And something about him just connected with me at a deeper level. I kept working with him slowly throughout the morning trying to get him used to me and my invasive camera. His watchful eyes followed me wherever I went in the room. I wondered if he was expecting me to try to sneak some shots when he wasn’t ready. Finally, Auntie got him to move his hand away from this mouth. When he did, I struggled with my emotions as I snapped a couple of quick shots. I thanked him in Tagalog and tried to appear casual as I walked away. I can’t stand having my picture taken. Why? Because of my chubbiness. I hate the way that the camera steals every inch of curve from my jawbone making my face appear even rounder and fatter than it really is. The line breaking up my face from my large, second chin is stolen so that my face looks like a white basketball. I felt like such an idiot. Such a vain, stupid fool. Here was a boy with a significant facial deformity who was hiding behind his mask for a real reason. And then there was me whining “Oh, don’t take my photo. I look too fat!” I felt like scum of the earth. I changed that day. I’m still no fan of being in front of the camera, but you won’t hear me complain if someone wants my photo. Hell, I’ll even volunteer if it’s a good memory, or to be with my son in a photo. 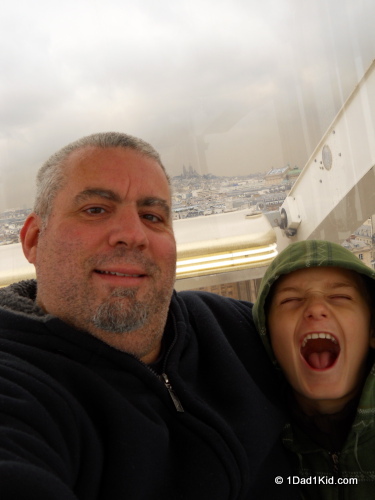 Riding in the ferris wheel in Paris, showing my son the importance of fighting our fears, I snapped a photo of us together. As I looked at the digital monitor, my enormous, boneless face peered back. I had a second where I winced, but then I saw the Paris skyline behind us and Tigger’s trademark dorky smile, and I smiled. Yeah, I’d keep that photo. And it was our Facebook profile photo for a while, too. When we leave ourselves open, travel transforms us. At least a hundred children with broken smiles taught me something powerful. How could I let their lesson go to waste? I’ve said it before, and I’ll say it again: When we leave ourselves open, travel transforms us. Sometimes more deeply than we could ever imagine. I’m grateful to Ian. With a single, incredibly vulnerable, shy smile, he taught me volumes and put me on the path to accepting myself. Buddha belly, moobs, second chin, thunder thighs and all. And I’ll even smile for the stupid photo. Yet another reason to admire you, Talon! This is an incredible story – both in the message, the self discoveries, (and your wonderful writing style). You certainly delved deep into the human condition of vanity – and how we can get consumed by little things, when there’s certainly people who have it much harder than ourselves. I’ve always been self conscious about my size too – I’m very skinny and have had that ‘pointed out to me’ most of my life. “Gee thanks, I didn’t realize!?”. These children must have experienced torment unlike anything we could ever begin to imagine, and you’ve taken part in a journey of healing for them which will 100% change their lives and how they see themselves… literally. Thanks for sharing, and thank you for helping in this Talon! What a beautiful touching story. It will be indeed live changing for those children to have the surgery. I do not like my photo taken either but will for sure reconsider after reading this wonderful story. It truly is. 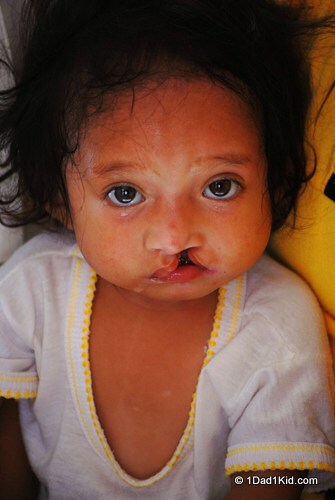 For the children with a cleft palate, it’s an important surgery to reduce the risk of infections, aid in speech, and to help with nutrition. 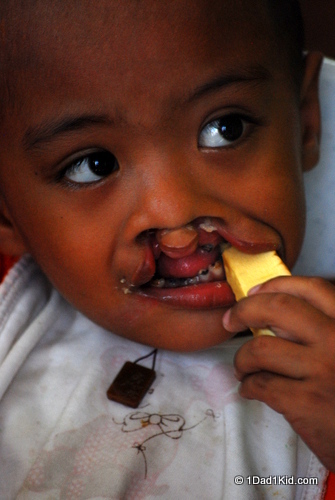 But for the kids with a cleft lip, it makes life almost unbearable for them. Thanks. It sometimes is nice to put our “problems” into perspective. I allow pictures of myself with my son but cringe at many of them. 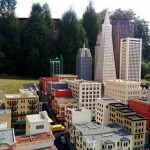 But I have been looking at it as memory shots for my son. That is how he knows me, big belly and all. So why not have a record? Ian, the one in the story (my son is a 14yo. 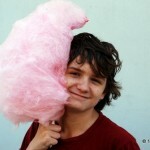 Ian also), will probably, hopefully, look back and be grateful of the pictures of of his past. Looks like more than one person was improved at this surgery. Ian, Talon and many that read this blog. Again, Thanks. It’s definitely one of those situations where everyone involved was touched some how. what a lovely post. Not sure what else I can say, but it’s making me think a whole lot. Thank you. Hi Talon, what a fantastic story and what a result for Ian and for all the kids who have had the opportunity to have had the surgery…life changing like you said. Thank you, Carly. It was amazing to hear their stories. And to see those smiles as they looked in the mirror to see their new face was too incredible for words. Great article Talon! I will seriously think twice about avoiding pics in the futrure. You have led such an amazing life, thank you for sharing not only your present but your past with us! I gained a nephew this year with a cleft palette & lost him again two days later, so seeing these pictures & reading your words really struck home. I applaud your thoughts on having your photo taken & wish many people thought the same, also, I can’t thank you enough for writing this. Oh my! I’m so sorry! What a hard thing to experience. Beautiful post, Talon. It is hard and so important that we put things into perspective at times. We are very privileged, and no matter how imperfect we (or our lives) are, we are still very very blessed. What an amazing experience this must have been. One of my dear friends has been going on countless missions with Operation Smile for years and years (she herself was born with a cleft lip and it took her a LONG time to even be willing to face a child with a cleft lip–it was too personal and too tragic for her to face. When she finally did, she realized she had to have a greater purpose). Anyhow–it has made her into an incredible person, and I envy her ability to travel the world and provide a great service to so many people who desperately need it (not just for societal segregation reasons, but also for health and nutrition, as well)! That is an amazing surgeon’s job above–well done. Life changed. Good has been done. The surgeon did an amazing job. That was one of the other very impressive things for me. I spent 1-2 days in the OR documenting the surgeries, and I was so impressed with the high quality. One of the docs is a plastic surgeon, and he says he does the missions to remind himself why he got into medicine (he gets a LOT of breast augmentation and facelift patients in the States). You could always tell which patients he worked on because it was like art. Even though these guys are paying to be there and working long hours, each patient gets such great care. I’m glad to see you’re realizing your own beauty! It’s so important. This beautiful piece bought me to tears. I am actually speechless and that doesn’t happen very often. Any man with a heart so generous and a soul so deep does not need to be afraid of his own reflection. The beauty from within always glows outwards. Thank you for sharing this and bringing it to everyones attention. We just watched segment on 60 minutes about the Mercy Ships and the work they do. Amazing stories! There are some absolutely amazing organizations out there doing tremendous good. It’s refreshing to see. 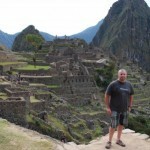 Such a beautiful article and a life changing experience as well. Thanks, Claudina! It was definitely a powerful experience. Talon, this article, so heartfelt and painfully honest, made me cry. That’s great writing! Now I want to do this. Can I? 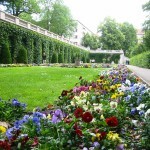 Are they looking for other bloggers to write about the marvelous work this organization does? And as an aside, I am also not a big fan of having my photo taken but in my case, it’s the wrinkles I don’t like to see. Your story had such a profound impact on me that I doubt I’ll ever think of having my photo taken in quite the same way again. Thank you, Barbara. They just completed their mission for this year, but I know they’re always looking for people to help. They usually announce the next year’s mission around the summertime. One of the beautiful things about it as they need outreach people which requires no medical background or skill. Sometimes you’re just helping families in the preop/postop waiting room, other groups go out into the community and look for former patients to check in on them and to see if any new siblings have needs, etc. There’s so much that needs to be done, and it’s an absolutely amazing thing to experience. And thank you for the compliment on the writing! Means a lot to me. So happy to hear that you were impacted by me sharing my story as well. Ian is beautiful… and so are you. Thank you! 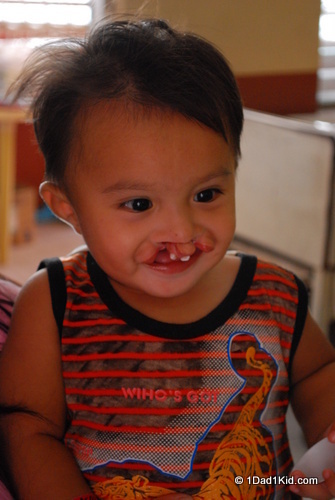 Seeing his photo from a week after his surgery with him wearing a big smile was absolutely priceless.